With Carroll’s booked for whatever day our schedules were synchronized, we were on our own to find a home away from home for the week. We found our home and now we to find our way back. Having two drummers presents a problems for most normal rehearsal studios, and as such, it lead us back to our own stomping grounds, Smash Studios on 36th street. G-d help us! It was their Studio A where they were able to accommodate Deadstein with most of our needs. Smash Studios was our regular jamming location for a while in the Terez days back at the beginning of the millennium when we reluctantly resort to it when needed. This week we had such a need. It’s not that the place is awful. I happened to find free parking on the street, getting there was quick this evening and the room was fairly spacious and sounded OK. In many respects, with its deadness, Smash Studios sounds better than Carroll’s, but the vibe and the instruments just don’t hold up to what Carroll’s offers us. Actually, I had a pretty good, brown-faced Twin reverb which suited my needs just fine. I was still playing my Made in America Roland Ready Start, but this week without all the MIDI stuff. The sound of that guitar is a bit sterile compared to my ’79-Strat, so it was tough for me to lay any blame on the amp versus my guitar. In most respects, my setup was about as good as it gets. I do appreciate Alan making the sacrifice and leaving me the lone Twin while he had to struggle with the Ampeg amp he used all night. Kevin had this big rig which I assume he didn’t like but I thought I sounded pretty good, maybe a bit too tinny. We will never know about the sound because the recording of the night onto Smash’s provided CD recorder was an abject failure. While sound came out of the CDs it was with constant jitter and was unlistenable. It was probably a good thing because from what I could gather through the jitter, it sounded like the CD would have primarily vocals as it recorded the mix of the soundboard with the addition of one ambient mic in the room. Probably overall, a good thing that the music isn’t available. Nevertheless, I was able to coax a setlist from the rubble so the setlist provided is probably pretty accurate. It’s not that we played too badly. I think the drummers had a pretty good sound going through the night and Marty on keys was able to find balance at certain times during the night, though he had struggles with it early on in the night. Rich was a late cancellation, coming down with the flu and Marty was right there when called upon. This time sans-zip drive. Finally, the PA seemed dull and flat for the first song or two but after a little adjustment we got it sounding good enough for us. We were able to get Donna to join in effectively with us providing the good background vocals until she had to leave at 11pm to catch a train back to Brooklyn, I didn’t provide a practice setlist earlier so she was on her own and having to latch onto a few songs she never heard before. It’s good practice for the reality which is Deadstein and Donna’s a good sport about going with the flow, ebb and tide of Deadstein. With the change in location we had no guests and very little to do but play our merry hearts out. While it is good to be on the road and explore different places, “NOT”, it will be tremendous to be back in the warm comforting environment of Carroll’s. 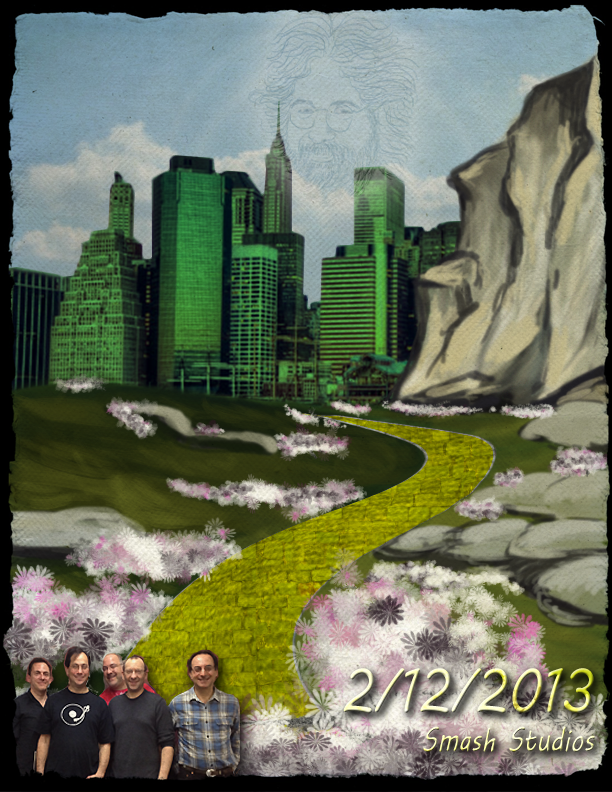 Can’t freakin’ wait to be there, I just hope we can find our way back home. We don’t have music to listen to, but this is what was played. I was at dog camp last week and missed the Deadstein jam. It was probably a Brotpen dominated night. This week the tide turned as Brotpen was sick and unable to attend. Marty Goodman filled in on the keys so we kind of had that covered. It was Scott’s birthday earlier in the week so it should have been his turn and obligation to call the setlist. Unfortunately the stars didn’t quite align to achieve that. First of all, Marty’s repertoire favors the simple songs, as he calls them, and I was on the waning side of a cold I picked up at dog camp. With the prospects of having to sing every song for the night while being as sick as I was; well let’s just say it wasn’t going to be pretty. In the end, it was a challenging night. I was coughing between every verse, I think we lost Kevin sooner than usual and Marty didn’t quite know every thing we played. My head was swimming in it’s own mucus. Thank G-d I think Scott seemed to be on his game and leading us more so than usual. It was a big help. I was able to borrow an MP3 recorder to capture the night so I do have MP3s to listen to, so check them out if you must. The recorder at least worked. 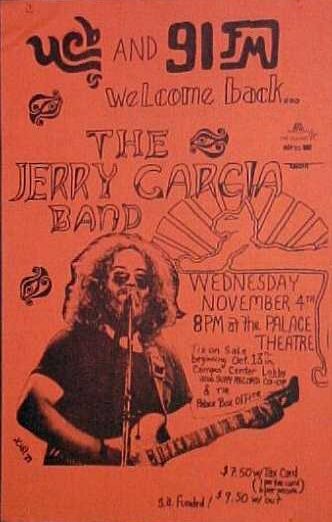 By the way, the orange poster for the Nov 4, 1981 JGB Concert at the Albany Palace Theater was from my first show. I was just searching the web for an image to place up for this weeks jam posting and stumbled upon this thing. It popped out in my mind as hung in my freshman dorm-suite. It’s a pretty cool memory.